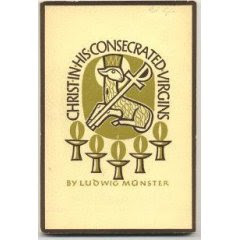 A mentor of mine recommended the book, Christ in His Consecrated Virgins: The Marriage of the Lamb by Ludwig Munster. As far as I know, this is the only book written specifically for the formation of women who were to become consecrated virgins according to the liturgical rite. Because of this, it specifically addresses theological identity of consecrated virgins as such. It was certainly a welcome surprise to find a book addressed directly to theology of my particular vocation. However, as the book was originally published in 1957, before the promulgation of the revised Rite and the subsequent provisions for consecrated virginity lived "in the world", this book is actually written for nuns (probably in Benedictine communities) who were to be consecrated some years after their perpetual or solemn profession. Consequently, Christ in His Consecrated Virgins does not refer to many aspects of consecrated virginity as it is expressed in canon 604 of the 1983 Code of Canon Law. 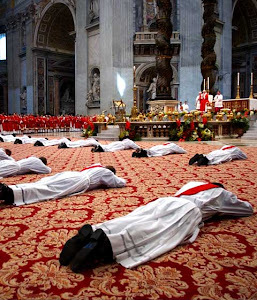 Christ in His Consecrated Virgins is structured so as to discuss various components of the vocation to consecrated virginity as they correspond to the different elements of the pre-Vatican II Rite of Consecration (which is included as an appendix). For example, the chapters have titles such as "The Call of Christ", "Litany of the Saints", and "Authorization for Reciting the Canonical Hours". One problem with this is that several elements of the older rite did not survive the revision called for by the second Vatican Council (such as the Anathema--which, if you'll pardon the colloquialism, I think was kind of cool! ), and some of the elements described only occur when the virgin to be consecrated is also a nun. But despite this slight obsolesces, I still find the format to be enriching and helpful--it certainly re-enforces the maxim "how we pray is how we believe". Further, it is not too difficult for me to see the similarities and parallels between consecrated virginity as it existed in 1957 and consecrated virginity as it exists in 2008. 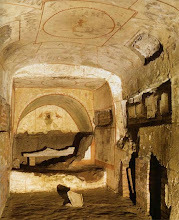 I think it will take me a few readings before I absorb everything Christ in His Consecrated Virgins has to offer. I think it would be great if a companion book was written about the revised rite. Maybe my own weak attempts would make good future posts for this blog! If you're interested in writing a companion book, I'd be interested in editing or co-authoring. I want to be a writer, too! It would be especially nice if there were a book, or even a brochure or bookLET for young women who are discerning this vocation, don't you think? My apologies for the belated response to your comment! 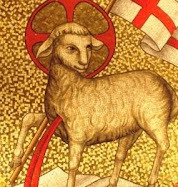 If you have written reflections on the new Rite of Consecration, I would love to print them as a guest post—just send me an e-mail sometime. You'll never guess which book I have now! :) I justified dropping fifty bucks for it (ouch) by considering the times I have bought textbooks more expensive than that and not really read them. Better be good! I am very satisfied with the condition, clean unfolded pages plus a surprise bonus hand-sewn clear plastic cover! The Pope Is Coming This Week!